Help us earn up to $30,000 for our rescue! Today the team behind the ResQwalk app launched Animal Tales, an iOS app (Android available early 2015) that enables users to create 16-page illustrated storybooks featuring their pet. It’s simple, it’s fun, and 20% of the proceeds from every book sold will go into the ResQwalk weekly donation pool. 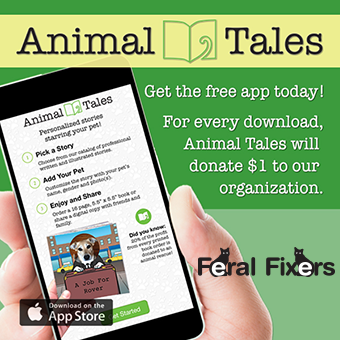 For every download of the app Animal Tales will donate $1 to Feral Fixers (there is $30,000 up for grabs). Help us raise much needed funds for our rescue. Get the app here. To learn more about the app and to see how it works, please visit the Animal Tales website - Thank you!